Call for Book Donations for the Friends of Brooks Memorial Library Book Sale! The Friends are ramping up for their Like-New Holiday Books Sale! Donations of Books, CDs and DVDs in good condition will be accepted at the Library circulation desk. Brattleboro, Vermont, September 24, 2018. Unique, rare, important and humorous historical treasures and archival collections reside within Windham County’s numerous historical societies, public libraries and museums. 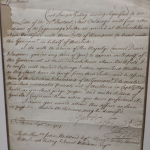 The Brattleboro Words Project’s Thursday, October 18, 2018 Roundtable Discussion will gather representatives who work with these treasures in recognition of National Archives Month in October. The discussion will take place at 6:00 pm at 118 Elliot, 118 Elliot Street, Brattleboro, Vermont 05301. The Roundtable event is free and open to the public. Light refreshments will be available. The Friends of the Moore Free Library invite you to their Annual Book Sale on Saturday, September 29 from 9 am to 4 pm. The giant sale takes place in the Union Hall, just off the Common in Newfane. Categories arefiction (including classics and a large selection of mysteries), history, biography and memoir, essays, nature, travel, art and music, how-to, health, young adult, philosophy and religion, cooking, gardening, humor, Vermont and New England, children’s literature, DVDs, CDs, and more! We are pleased to share this live stream of our program tonight, for any of you who could not make it here in person! BCTV could not make it tonight, so this is all we will have. After it is over, it will stay on our Facebook page, where you will be able to find it under “videos.” Enjoy! 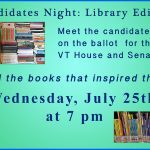 Join us on Wednesday, July 25th at 7 pm, as candidates who are on the ballot for Vermont State Senate and State House of Representatives discuss their favorite books. They will share everything from their childhood favorites to contemporary titles, and explain how those volumes helped to form their world view. The list of candidates is: Becca Balint, Mollie Burke, Wayne Vernon Estey, Emily Kornheiser, Valerie Stuart, Tristan Toleno and Jeanette White for this unique perspective and a lively literary discussion at 7 pm, Refreshments will be served! 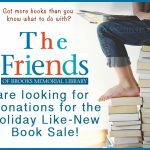 Friends of Brooks Memorial Library Summer Book Sale! 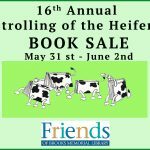 The Friends of Brooks Memorial Library are hosting their 16th Annual Book Sale fundraiser. Stop by and you will find plenty of good books, DVDs, CDs, audio books, and puzzles!